How I got it: The publisher provided a copy in exchange for an honest review. Ellie considers herself to be a normal girl, nothing too out of the ordinary. She is not the best in school but tries her hardest, has a group of close friends, and enjoys going out and having fun. But she has been having the strangest nightmares for weeks, and there's a strange guy hanging around her school who seems interested in her. Then, on the eve of her 17th birthday, her worst nightmares come to life. It turns out she is the Preliator, the biggest defense Heaven has against Hell. She is destined to hunt reapers, monsters that drag human souls to hell, a job she has had for centuries and has died for countless times, always coming back in another life. The strange tattooed guy she's been seeing around her school is her Guardian, Will, who has known her for 500 years. But it seems like this life, as Ellie, is different from her past ones; according to Will, she is more human than she has ever been, and she is having a harder time remembering her past lives. Plus, a deeper evil exists that could to destroy Ellie forever—if it awakens. The concept for this book is a good one. Mystery surrounds Ellie, her past, and what she is, something not even Will is sure of. She can destroy demons with an awesome set of blades that can light on fire (angelfire, a special kind that won't burn anyone except demonic reapers) when she wishes it. There is forbidden romance. On paper, it looks pretty good, but the execution was not particularly spectacular. Despite the book's length (the ARC has just over 450 pages), I felt like there was too much crammed in too fast. Much of the worldbuilding was done through dialogue via Will, though Ellie would have the occasional flashback, which I wish there had been more of. Those were much more interesting than listening to Will explain everything. It's clear Moulton knows her world well, but it all felt rushed and confusing. The writing was a bit clunky, as well. There were a lot of cliches, and certain phrases and words were used far too often, especially "my heart sank," and there was a lot of perking up and scoffing going on. It got to the point that I winced whenever I saw one of those phrases. There was a lot of materialism in the book, in the form of consumption and name-dropping, especially with cars, that seemed very out of place. Ellie comes from wealth, as do her friends, and this is made abundantly clear throughout the book. The gross consumerism was just a hair shy of the fantasies that can be found in series like Gossip Girl and Blue Bloods—the consumption in those books are deliberately over the top and fun to read about, but here it just seemed unnecessary and forced. Some people will find Ellie and Will's relationship romantic, especially fans of forbidden paranormal romance. Though I found it tiring and got bored with the long descriptions of how Will looks and the way he makes Ellie feel, I'm sure there will be at least some swooning over Will by others. But despite all the negative aspects of the book, it was certainly a page-turner. There were a lot of action scenes that kept me interested, and the mysteries of who each character might be made me want to keep reading to find out what I could. 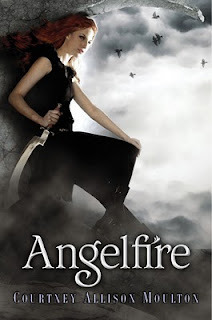 Overall, I don't think there is anything particularly special about Angelfire. It's a typical paranormal romance with a mixture of folklore, mythology and Biblical influences. The action makes it a page-turner, but I found myself skimming and not missing a whole lot. I'm not sure I'll pick up the sequels, but this book will find a number of fans because of its inclusion in an increasingly popular subgenre. I shouldn't be so excited to see a negative review of this book but I didn't really like it either especially the consumerism and the fact that it seemed to drag on. So many other people seemed to love it but I wasn't really a fan (and I didn't like this Will as much as I like Firelight's Will). I'm glad to see other less than positive reviews. I put it down after page 50 (I didn't review it - don't review if I don't finish). Bingo on the chiches. I agree with Bookworm. It's probably a bad thing that I get excited when I see another negative review of this book, because I didn't like it. I also noticed the over-use of cliches. My major problem was with the world building. She has some elements to her world that I just couldn't accept, that really didn't sit well with me. I'm so glad I'm not the only one who felt this way. So many people loved it and I just... really didn't. I really enjoyed this one because of the concept. I thought it was great, especially towards the end. I've got to say, though, I really disagree with you on the wealth issue. I've never lived in Michigan, but I know of a couple small towns with a lot of wealth. I'm sure there are a bunch of places with a lot of wealth like that. But I just didn't see the point in including it in the book. It was off-putting for me, and in fact made me dislike the characters. *brofist* I didn't care much for this either, it was just so...unengaging. The writing was utterly bland, and both Ellie and Will were pretty boring, character-wise.